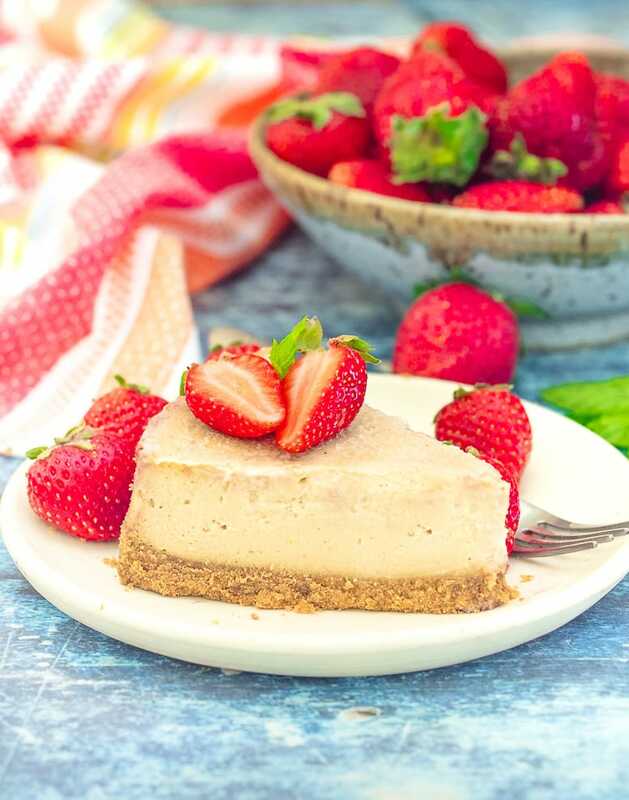 This ultra-rich, decadently creamy and smooth Vegan New York Cheesecake is surprisingly quick and easy to make. Enjoy as it is or get a little fancy with your choice of topping. It is dessert perfection and you absolutely need it in your life…..
Stop right there. This is a warning. 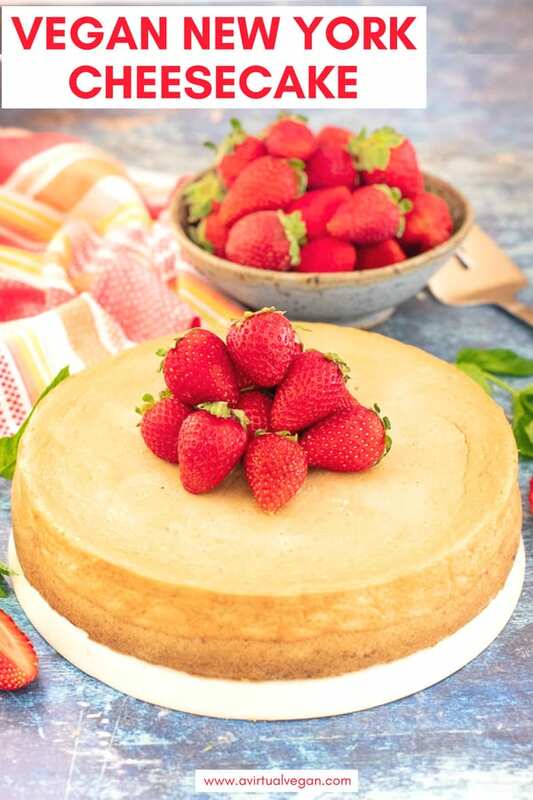 This Vegan New York Cheesecake is for people who are serious about their dessert. Like really serious. Proceed with caution. 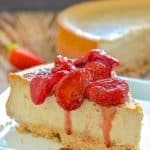 If you don’t want to eat slice after slice of classic, creamy, velvety, rich cheesecake and spend all of your time coming up with delicious ways to top your perfect baked cheesecake, then step away now. Find yourself another recipe. 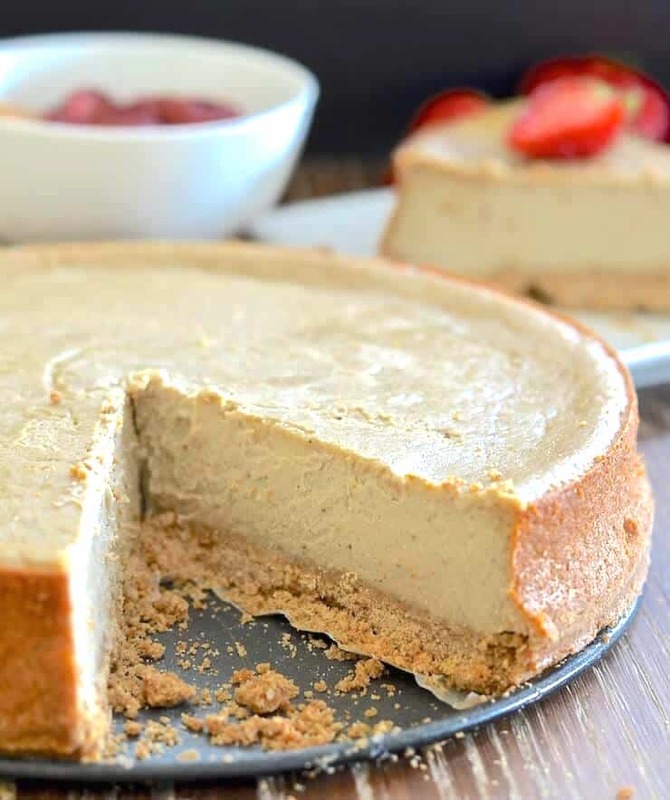 Vegan Cheesecake has got to be one of my all time favourite desserts. 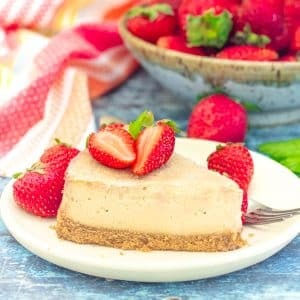 I love anything rich, creamy and decadent and it doesn’t get much more rich and decadent than this Vegan New York Style Cheesecake. I have made and eaten a lot of vegan cheesecake (all in the name of research of course ????) and whilst they are mostly very lovely, they aren’t like “real” baked New York Cheesecake. 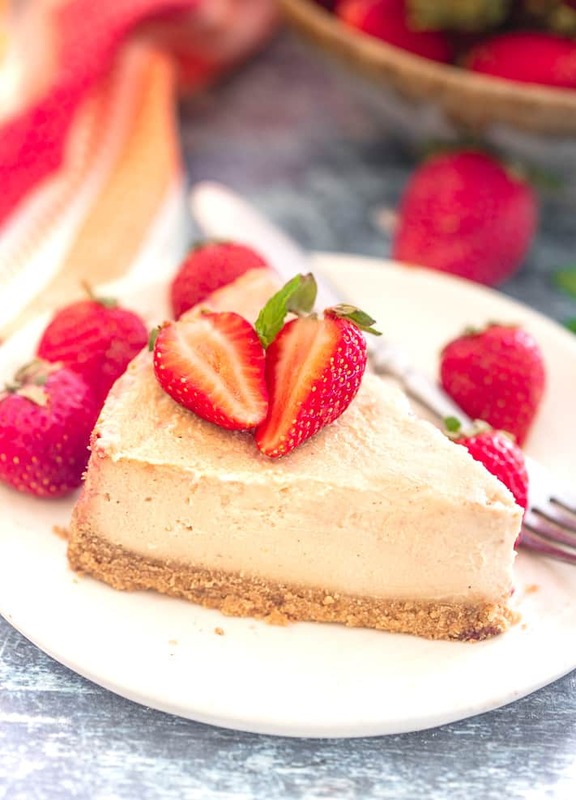 Most vegan cheesecake tends to be raw and don’t get me wrong, I don’t have a problem with that and really enjoy eating them, but they tend to be very smooth and quite light in texture. They don’t have that ultra-rich, creamy density that traditional baked New York style cheesecakes have. 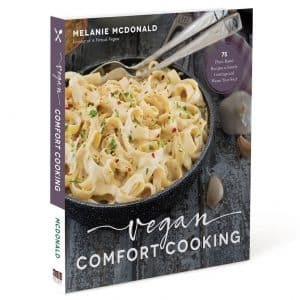 Many of them also need to be kept in the freezer, or they use coconut oil to help solidify them and melt into a puddle if left out of the fridge for any length of time. My Vegan New York Cheesecake is different. It is just like a “real” baked cheesecake in texture. Dense, rich, super creamy and very satisfying. Whilst there is oil in the crust, there is none in the cheesecake filling. 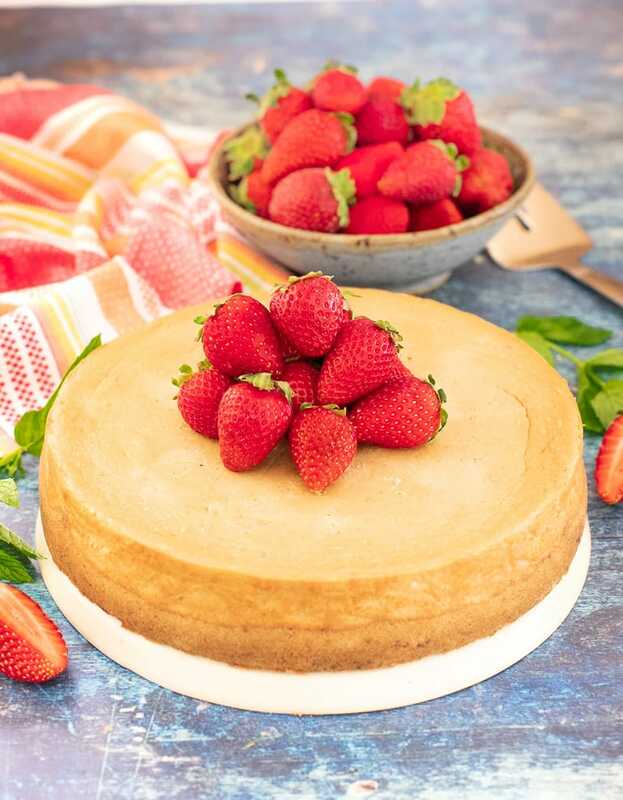 This means that if you follow an oil free diet you can make the cheesecake top without the crust and still stay on track (see my recipe notes for tips on cooking it like this). 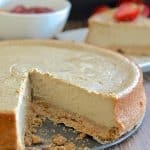 MY VEGAN NEW YORK CHEESECAKE FILLING HIDES A SECRET INGREDIENT! 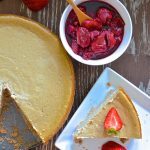 To get the perfect vegan baked cheesecake texture I experimented with many different ingredients and methods. I settled for a combination of cashew nuts and chickpeas. Yes, the humble but quite awesome chickpea is the secret ingredient here. Please do not let that scare you off. You would NEVER know. 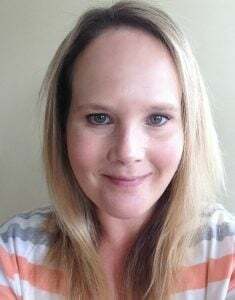 You might remember that they made a surprise appearance in my Healthy Raspberry Chocolate Fudge Tart, and that’s what gave me the idea of adding them here. 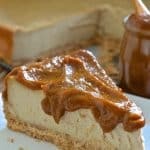 The cashews give the filling it’s creaminess and the chickpeas give the denseness, in a similar way that heavy cream cheese and eggs would in a non-vegan baked cheesecake. It’s so similar in texture it’s scary. 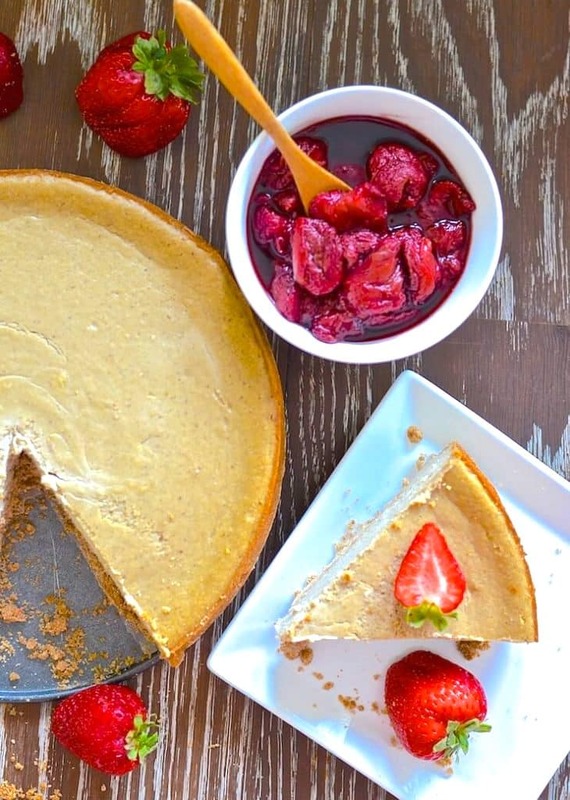 This Vegan New York Cheesecake is surprisingly easy to make. First you need to make the crust and let is set in the fridge. 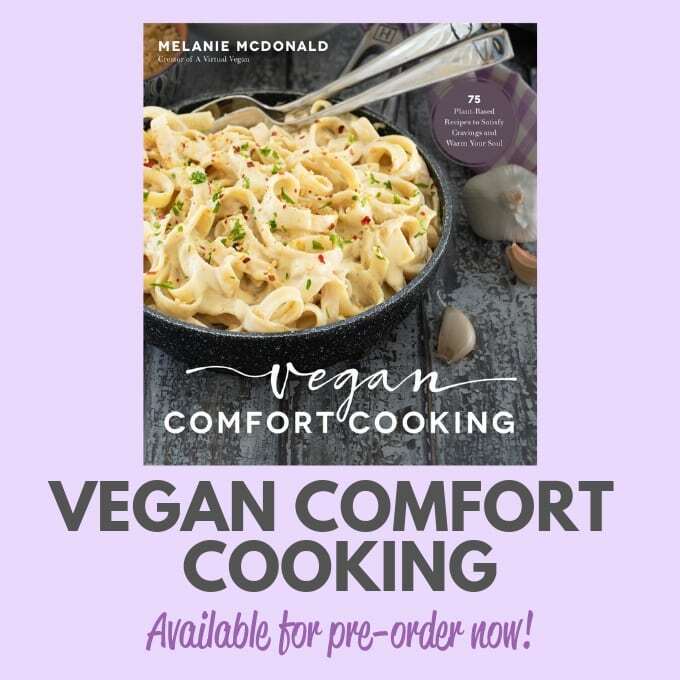 For this I use my Vegan Digestive Biscuits recipe but to make life easier you can use store bought digestive biscuits or graham crackers (a lot are accidentally vegan). Have you tried my Vegan Digestive Biscuits recipe yet? 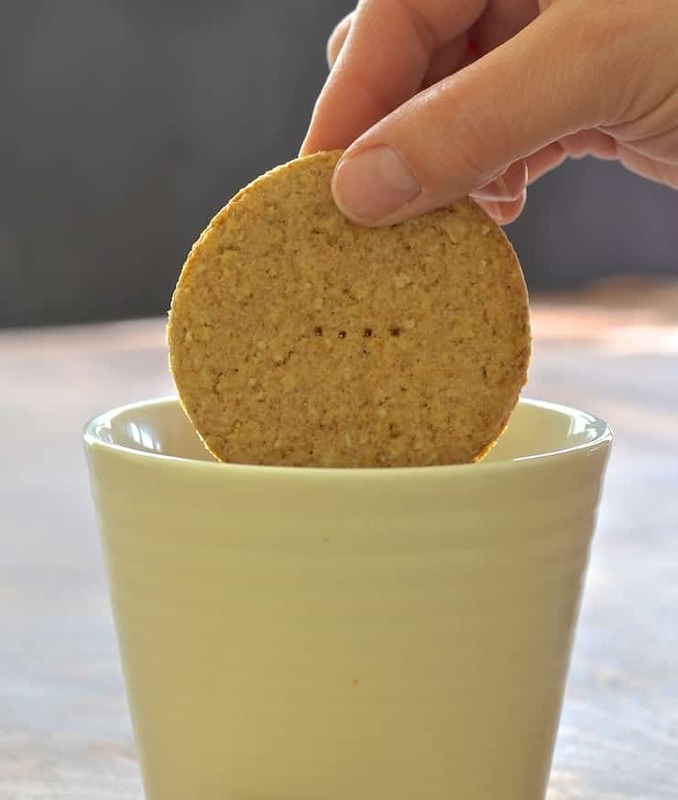 They are so good and perfect for dunking in your tea or coffee! Plus they make an awesome cheesecake base! While the crust is setting up in the fridge, blend the filling ingredients together until smooth. I recommend soaking the cashew nuts in boiling water before blending in the instructions, but if you have a high powered blender like the one below, or a Vitamix then you can get away without doing this. Once the filling is blended and smooth, pour it on to the base and bake. For such a decadent dessert it’s all pretty easy really! Allow to cool then refrigerate for a few hours before serving. 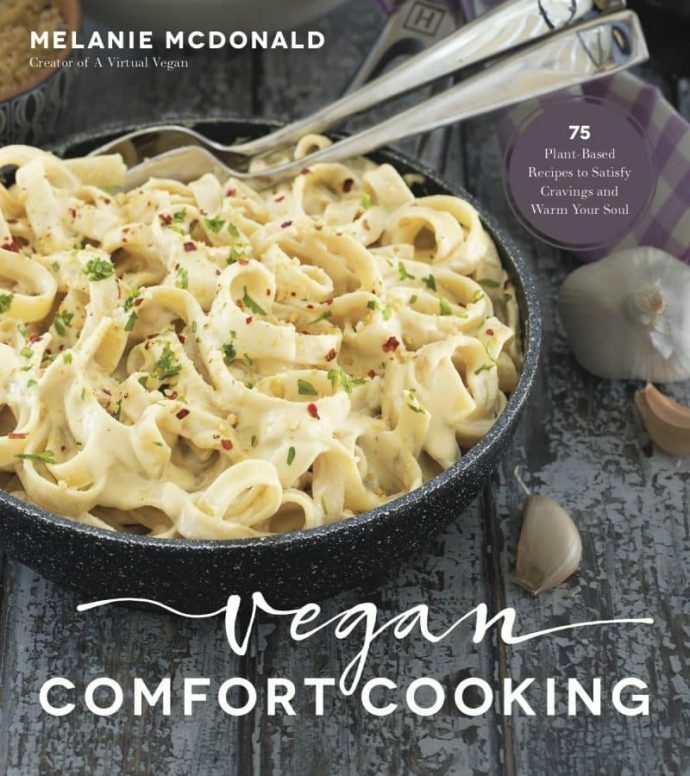 Whilst this Vegan New York Cheesecake is absolutely delicious on it’s own, I love to top it with a little something extra. I think the Pumpkin Caramel Sauce is my favourite cheesecake topping so far. It is a very indulgent combo and is extremely rich but that’s how I like my desserts! For a festive spin on this cheesecake you could top it with a layer of my sweet, boozy Mincemeat. And just like the real thing!